Well it's been a really busy couple of days. Russ's first field trip was to see the Urologist back over at the Scripps facility, of course I had to get a picture of him in front of the hospital where he lived for over two weeks. The doctor says the catheter stays in until the first of January then he'll see if the bladder injury is healed, if it is the catheter stays out. Pray for stays out. 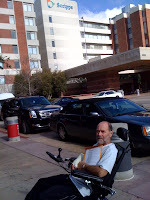 On Tuesday it was back up to La Jolla to visit the orthopaedic doctor that is in charge of his wrist. The cast came off, xrays were taken and the doc says everything is healing well. 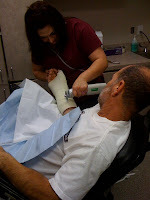 Russ left with a splint and instruction that he can now remove it twice a day and flex his wrist and fingers. He was so happy, Dec. 29 the pins come out and he can get his arm wet. He'll wear a brace for a while and get to start therapy on his arm. So Tuesday afternoon he had PT and OT and then it was time to party. There was a Holiday party Luau, catered by L and L. Family was invited and Steven was all over the island food, we even got a show Hula dancers. 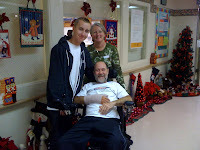 It was fun to spend time with my two men out of a hospital room.